If you thought that Motown was little more than pop tunes and cheesy soul found at school reunions and wedding receptions, then this album can change all that. You see beyond the slow numbers like Ben, and bubblegum soul of Stop in The Name of Love (neither of which are on here by the way), there are a whole host of real soul floor-fillers; songs that if the label was blanked some (like myself) may not believe they were on Motown at all. So the initial trepidation of what this double CD may offer soon turned into delight as my ears were treated to a fine selection of 50 apparently “never heard before” tracks (well 40 or so maybe, there were a handful of ballad type numbers that got skipped) and this album soon found itself on ‘repeat’ in the garage as I wrestled with a number of engine oil seals the other week. Stand out tracks? Well with songs from legends such as Stevie Wonder, Brenda Holloway, The Marvelettes, The Four Tops, etc it’s a tough one. Kidnapped by The Blackberries kicks it all off in an upbeat style with, admittedly, a definite Motown sound to the song, but it’s a cracker nonetheless. Keep On Tryin’ by the Fantanstic Four follows and shows that a ballad doesn’t have to drag on for ages, then Your Kiss Kiss by Marvin Gaye and Oma Heard suggests more 1960s pop than Motown. Nice. Cool Cool Baby by Jr Walker has definite resonations of Road Runner, but what the hell, it’s great too, while You Didn’t Show Girl shows The Temptations in a different light. My Baby Changes Like The Weather by The Vows has definite Northern leanings, as does The Day You Take One by Gladys Knight, while Frank Wilson’s Ain’t Gonna Tell You is more raw soul that has you singing along the first time you hear it. Meanwhile on Disc 2 I’d Cry by Chuck Jackson gets my vote, Edwin Starr doesn’t fail to deliver with Born To Be Bad and Whole Lot of Shakin’ In My Heart by The Utopians is a definite floor-filler in my book. Also included is a 20-page booklet with detailed sleeve notes by Motown connoisseur Paul Nixon, plus a collection of photos from the Motown archive. 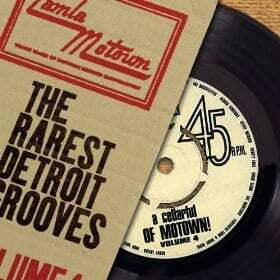 This is the fourth volume in this series that proudly boasts the release in total of over 200 vaulted examples of Detroit’s finest sounds that never made it past the recording studio and for my money this album contains a vast amount of tracks that make you wonder why they’ve been hidden away for so long. This is a gem.